It becomes a big problem, when a person close to you loves many things. Selecting for a gift, which includes their likes and dislikes becomes necessary. 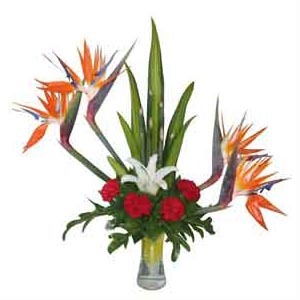 If you are looking for a special gift, then this combo of three beautiful flowers Birds of Paradise, Lilies and Carnations arranged creatively in a designer vase with fresh green leaves is the perfect gift for people having varied tastes.